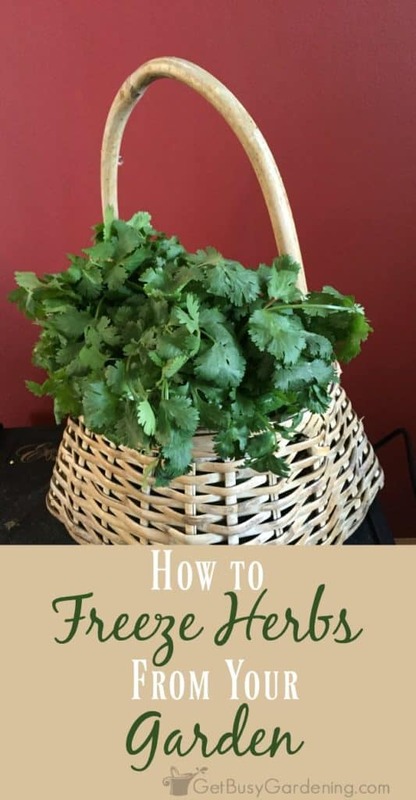 Herbs are easy to grow in containers and gardens, and many times you can be overwhelmed with fresh herbs during the growing season. 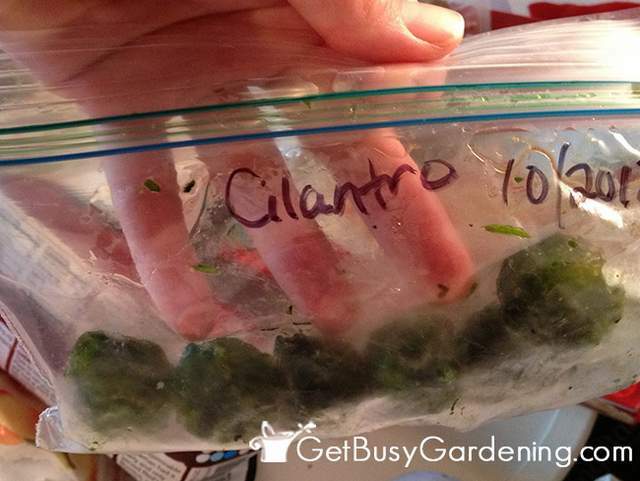 One of the best ways to preserve garden fresh herbs, and retain their flavor is to freeze them. Freezing herbs is easy, and doesn’t take much time. Plus it will be a huge money saver through the long winter months since you won’t have to buy fresh herbs from the grocery store anymore! I can’t stand wasting food, especially since it’s so expensive to buy fresh herbs at the grocery store. So I always preserve them for later use. Better yet, I like to plan ahead and preserve as many fresh herbs from the garden as I can, so I never have to buy them at the store. Like I said, freezing herbs is very easy. I already showed you how I preserve chives by flash freezing them. You could do the same thing with leafy herbs, like cilantro, basil and parsley. 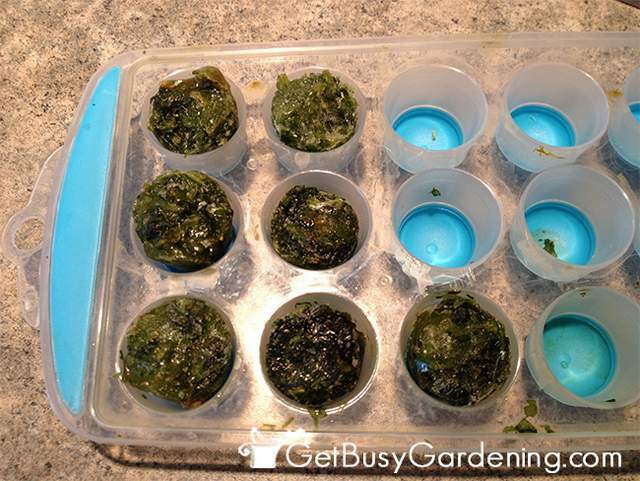 But I find that with these leafy herbs, it’s easier to chop and freeze them in ice cube trays. 1. Find an ice cube tray: I found this cute little ice cube tray at the grocery store, and it turns out, each compartment holds 1 tablespoon. Perfect for most recipes! You can also buy an herb freezer tray specifically made for freezing the perfect sized portion of herbs for any recipe. 2. Prepare the herbs for freezing: Freezing herbs doesn’t take much time if you plan ahead. If you have to purchase a large bunch of herbs from the grocery store, simply chop up the whole bunch when you’re cooking. Then scoop whatever you don’t use into an ice cube tray and put it into the freezer. By the time you’re done eating (or about 20 minutes), the herbs will be frozen and ready for storage. 3. Store herbs in the freezer: Once the herbs are frozen, pop them out of the ice cube tray and store them in a container in the freezer. Even if the cubes stick together, they are easy to break apart into pre-measured herbs ready for use in all of your cooking. Freezing herbs is so easy, and I love that none of my fresh herbs go to waste. It’s great to always have these herbs on hand, and it saves us money. Frozen herbs from the garden will last us most of the winter. 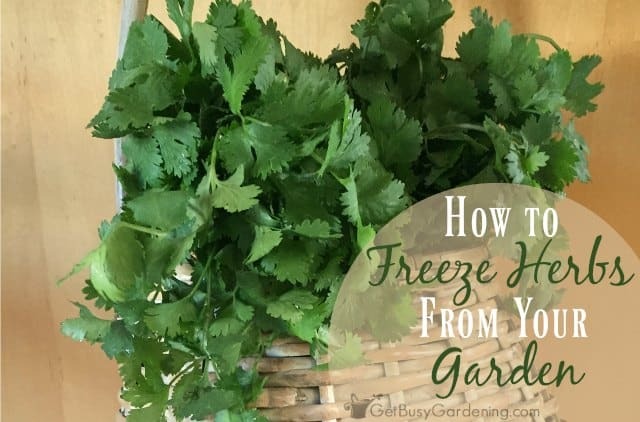 How do you freeze your garden fresh herbs? We've utilized this technique as well. It's pretty simple and another small thing that can help you get through the winter months. There's just nothing like some fresh herb flavors to get you through the cold and snowy season. Can I freeze any herbs…say, basil, sage, rosemary, Thyme, and oregano? Have you ever heard of any that you can't freeze? Thanks. I have also used this technique for rosemary, basil and parsley. Oregano and sage would work well too, I'm not sure about thyme. But I have never heard of any herbs that you can't freeze. I really love this idea. I used something similar for my chickens to have a cold, tasty treat on a hot summer day. Wow, that’s a great idea Mike! Did you put water into the trays as well? Or maybe they just look wet when they are frozen? I don’t put water into the trays. They stick together just fine without it. But, you certainly could.